In the context of its 10-year anniversary in 2014, RP Photonics has published this software and made it available via free download – even for commercial use! 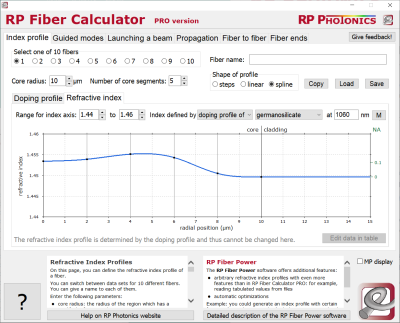 There is also an enhanced version (RP Fiber Calculator PRO), for which user licenses are sold regularly. Figure 1: Click on the image to start the demo video! Index profiles: define the radial refractive index profiles. Just click into the diagram to change a profile! Guided modes: get the properties of the guided modes calculated: indices l and m (LPl,m modes), effective refractive index, phase constant, effective mode area, fraction of power propagating within the fiber core, cut-off wavelength. The mode solver is powerful, reliable and efficient. Launch a beam: define a Gaussian laser beam and possibly misalignment of the fiber end, and get the powers launched into all the guided modes, also the total guided power. Propagation: see how the beam profile evolves in the fiber and what is the corresponding far field profile of light exiting the fiber. Coupling: calculate how light can be coupled from one fiber to another (a feature of the PRO version only). Read the detailed software documentation. See our quick video tour, if you like. Download the software and get started! Spread the word – your colleagues can also profit. How low does the index contrast have to be in order to obtain single-mode guidance? In which wavelength range will that work? How many guided modes is my fiber expected to have? How quickly will the multimode intensity pattern in the fiber evolve? What are the effects of having a central dip in the index profile, or a low-index region around the core, or whatever feature you can imagine? Is the fundamental mode still close to Gaussian-shaped? How critical will be a mismatch of beam focus size for launching light into the fiber? How critical are other parameters e.g. for displacements or tilts? Did you know that we offer a high-quality tutorial on fiber optics? Is the observed far field pattern consistent with the design parameters? What is the insertion loss of a splice between two different multimode fibers? How important is it to have matched core sizes and NA values? Find this out easily with the software, rather than doing tedious calculations based on equations found in textbooks, or just fishing in the dark. You may also test numerically what you have calculated in order to be sure. – – yes, with chromatic dispersion, nonlinearities, saturable absorbers, filters, etc. Our most powerful fiber optics software is RP Fiber Power – see the comprehensive description. If you work with passive fiber only, the cheaper “Passive Edition” will be sufficient.